Australian Fine Arts/David Pestorius is pleased to announce its participation in this year’s edition of Spring 1883, with a selection of works from the CityCat Project, the ongoing (since 2006) collaboration between Los Angeles artist Dave Hullfish Bailey and Brisbane Indigenous community leader and writer Sam Watson. In addition to the primary presentation in Suite 501, which will focus on Bailey’s 'call-and-response' engagement with Watson’s varying deployments of the Aboriginal flag in the CityCat Project, Watson will curate a film program for the foyer of The Establishment, the boutique hotel where Spring 1883 is held. Neon Parc is pleased to announce the exhibition Dave Hullfish Bailey + Sam Watson: CityCat Project 2017, an ongoing collaboration (since 2006) between Los Angeles artist Dave Hullfish Bailey and Brisbane Aboriginal activist and writer Sam Watson. Presented by Australian Fine Arts/David Pestorius, the curator of the project, the show bridges indigenous concerns and political action across geographic borders. Building upon works first presented at the Pestorius Sweeney House in Brisbane last December, the exhibition includes photo and text-based works created by Bailey in the aftermath of a visit in October 2016 to the camps near Cannonball, North Dakota, where Indigenous leaders and environmental activists came together to resist construction of an oil pipeline that has destroyed sacred sites and threatens supplies of drinking water. The exhibition features photographs of the Oceti Sakowin (Seven Fires of the Great Sioux Nation) encampment — where the Aboriginal flag flew proudly near the main entry — alongside archival images of the Aboriginal Embassy media event in Canberra in 1972. Through these juxtapositions, Bailey frames parallels between the birth of the Aboriginal land rights movement and the current resurgence of sovereignty issues raised in North Dakota. The exhibition will also feature documentary photo and video works relating to Bailey and Watson’s collaborative Maiwar Performance on the Brisbane River (Maiwar). Staged in 2006, 2009, 2012 and 2016, the performance involves unannounced interruptions to the normal routing of Brisbane’s popular CityCat ferries to highlight the colonial past of the river and reintroduce indigenous narratives. The location of the interruptions is both the site of an ancient Dreaming story and also the colonial boundary that excluded Aboriginal people from the city after dark. Seen by Watson as an important act of Indigenous empowerment, the Maiwar Performance seeks to restore agency to the Indigenous people living around Brisbane by bringing past narratives alive within the community, and by projecting the possibility of a future not definitively determined by the recent past. 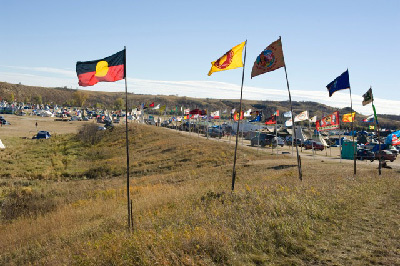 A question operating just beneath the exhibition is the ways in which the Aboriginal Embassy and the ongoing encampments in North Dakota can be understood as incubators of inter-tribal solidarity and emerging pan-aboriginal identities at national and international scales. 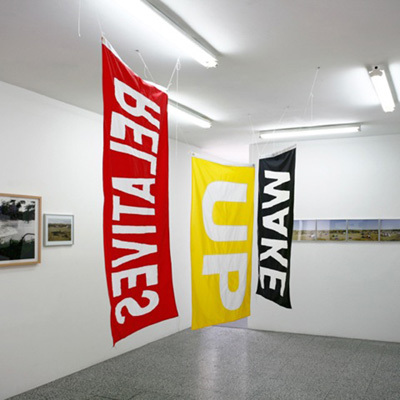 Bailey explores these themes through text-based works, including flags which conjoin formal aspects of the Aboriginal flag with the sentence “Wake Up Relatives” used by leaders to muster the water protectors to pre-dawn prayers and front-line actions during his visit to North Dakota last October. In these works the distinctive and highly elemental design of the Aboriginal flag comes to the fore, posing a visual synecdoche for the movement from concrete circumstances and local traditions to unifying abstractions and symbols. Transposing its signature red, black and yellow colours as fields for language re-opens questions of relation to their modernist cousins. Against the rise of nationalist movements worldwide, the flags become a series of problem objects which ask viewers to reassess the modern project 100 years in, and perhaps to reconsider their definition of ‘relatives’ in much deeper frames of time. Coinciding with the show will be a number of related events, including lecture/performances by Dave Hullfish Bailey at Monash University, Caulfield Campus on Thursday 16 March and RMIT Centre for Art, Society and Transformation on Friday 17 March, while on Saturday 25 March the Australian Centre for Contemporary Art will host the official launch of Dave Hullfish Bailey + Sam Watson: CityCat Project 2006–2016, edited by Rex Butler and published by the Sternberg Press. The launch by Aboriginal activist and historian Gary Foley will be preceded by a Q&A session involving Foley and Sam Watson, both of whom were key participants in the Aboriginal Embassy media event, and be mediated by Paola Balla, co-curator of ACCA’s current Sovereignty project. Join Brisbane curator David Pestorius for a discussion of the complex spatio-temporal dynamics of Jenny Watson’s An Original Oil Painting (Black + White) (for Nick Cave), 1979 and its twin An Original Oil Painting (Pink + Blue), 1979, and how these works capture the esprit de corps of artists and musicians during the post-punk years. David Pestorius is pleased to again announce his participation in Spring 1883, this year at The Establishment below Martin Place towards Circular Quay. While this downtown Sydney locale is today associated with business, finance and politics, it hasn’t always been so. In the 1930s and ‘40s it was the epicentre of Sydney’s avant-garde, Grace Crowley’s studio situated just around the corner on George Street, one of many in the warren of buildings back up from the water. Then in the 1970s, after the artists had left, The Rocks was the backdrop to Ant Farm’s performance Ned Telly and The Golden Spanner (1976). Commissioned by the Nine Network's A Current Affair, it was set in the shadow of the Harbour Bridge and brought to Sydney the American conceptualists’ iconoclasm first seen the previous year at San Francisco’s Cow Palace when they presented their notorious Media Burn (1975). Pestorius’ suite at Spring 1883 will conjure these moments with works by Ant Farm (San Francisco), Paul Bai (Brisbane), A.D.S. Donaldson (Sydney) and Melinda Harper (Melbourne). In his work for the fair, A.D.S. Donaldson will show a new video/multiple, which brings together little known documentary footage of Crowley with the remarkable improvisations of Brisbane composer and guitarist Ed Kuepper (ex The Saints) performing around the quay at the Sydney Opera House. For their part, Ant Farm will be represented by a rarely seen installation of Ned Telly and The Golden Spanner. Often exhibited as a video in Ant Farm retrospectives and surveys of media art (with Transmission: Legacies of the Television at the National Gallery of Victoria in Melbourne the latest instance of this), for Spring 1883 Pestorius will present The Golden Spanner itself, a sculpture last exhibited 40 years ago in the 1976 Biennale of Sydney at the Art Gallery of NSW. Melinda Harper, on the other hand, one of the most innovative inheritors of the Crowley legacy, will be exhibiting a large painting, its wave-like composition a dizzying mix of colour that is both optical and material. That Harper is currently the subject of a mid-career survey at the Heide Museum of Modern Art, where in the hands of Sidney Nolan, Ned Kelly was first mythologized in paint, only enhances its shimmer. Completing the presentation will be Paul Bai’s Other Side The Ocean (20004), a small painting that further animates the maritime theme running through Pestorius’ presentation for Spring 1883. We look forward to meeting you at The Establishment in September. To celebrate the occasion of Heimo Zobernig’s 15 year survey of his Australian works, the artist has collaborated on the production of a limited edition artist’s book of lyrics by Brisbane singer-songwriter Robert Forster. 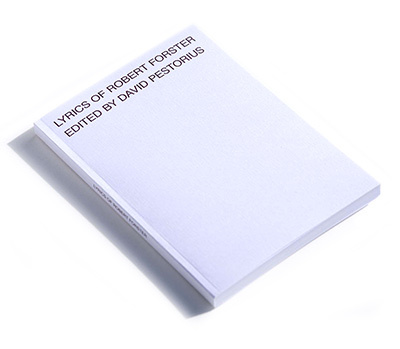 Edited by David Pestorius, the book is the first devoted to Forster’s lyrics and includes more than 50 songs from all phases of his now four-decade long career with The Go-Betweens (1978–1989; 2000–2006) and as a solo artist (1990–1999; 2006–). The selected songs are grouped thematically under headings (eg. ‘Colour’, ‘Desire’, ‘Divide’, ‘Conquer’, ‘Contempt’, ‘Place’, ‘Point of View’, to cite just some), which serve to enhance the often oblique nature and interpretative potential of Forster’s lyrics. The book adopts a rough truth-to-materials approach, with the typography and layouts from original album sleeves and CD booklets redeployed where possible. The book also includes a brief biographical entry, a discography, and a small selection of illustrations that constitute a parallel narrative, which points up Forster’s historical engagement with artists and the world of art. 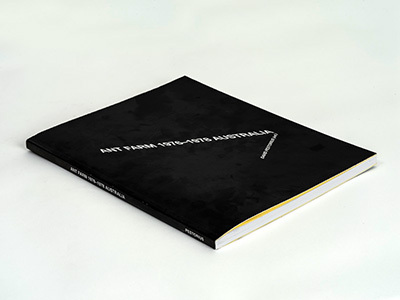 Lyrics of Robert Forster was published by KANN-Verlag, Frankfurt, 2015, 21 x 14.7 cm, b&w, 140 pages, perfect bound, with offset printed cover by Heimo Zobernig, in a limited edition of 120 copies. The San Francisco conceptualists Ant Farm (1968–1978) are famous for their radical architecture (The House of the Century, 1973), iconic land art (Cadillac Ranch, 1974), and pioneering video/performance (Media Burn, 1975). Much less well-known are Ant Farm’s projects in Australia. Yet it is undeniable that their 10 week visit to Australia in mid 1976 turned the group upside down in more ways than one. Importantly, the focus of their work shifted, with Oceania not only becoming an important base, but also a critical concept for the group. Central to this shift was perhaps Ant Farm’s most ambitious project, the Dolphin Embassy (1974–1978), and in January 1977 the group’s co-founder Doug Michels moved to Sydney to establish a consulate there. 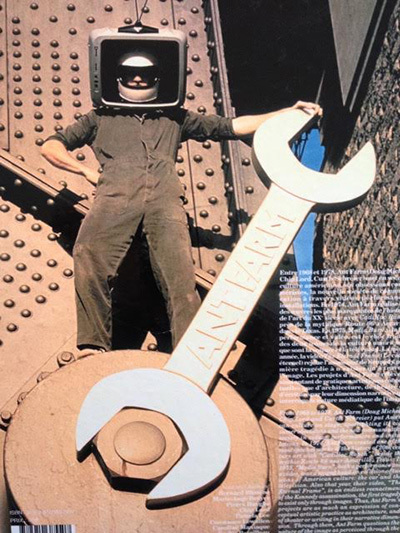 Until now, the historical accounts of Ant Farm have misrepresented and misunderstood the nature and extent of the group’s work in Australia. Equally, Ant Farm’s projects are invisible in any account of Australian art. Ant Farm 1976–1978 Australia is the first book devoted to the activities and critical reception of Ant Farm in Australia. It adopts a form favoured by Ant Farm — the time-line/photo-collage/book — and critically builds upon their monumental artist’s book Dolphin Embassy (Log: 1976–1978), Sydney, Australia. Ant Farm 1976–1978 Australia is published by KANN-Verlag, Frankfurt, 2014, 25 x 18 cm, b&w, photocopies, 155 pages, perfect bound, offset printed cover, edited by David Pestorius with cover by Liam Gillick, in an edition of 100 copies. Ant Farm 1976–1978 Australia will be launched at Spring 1883 by Dr Edward Colless (Head of Critical and Theoretical Studies, School of Art, VCA), on Saturday 16 August at 5pm. After the launch, which is held in co-operation with World Food Books, all enquiries should be directed to the publisher. David Pestorius Projects is pleased to announce its participation in the inaugural edition of Sydney Contemporary between 19–22 September. Australia’s new international art fair presenting modern and contemporary artwork, Sydney Contemporary 13 will present over 80 Australian and international galleries at the historical Carriageworks complex in Sydney’s inner-west. Underscoring this international flavour, the David Pestorius Projects booth will be dominated by the subtle, light-infused monochromes of New York painter Joseph Marioni (*1943). Described by the doyen of contemporary art criticism, Michael Fried, as "paintings in the fullest and most exalted sense of the word", Marioni's work was last shown in Sydney at the Art Gallery of New South Wales in 2001. Alongside the Marioni paintings at Sydney Contemporary 13, Pestorius will present a selection of recent and not-so-recent works by artists he has long been associated with, including Paul Bai (Brisbane), Dave Hullfish Bailey (Los Angeles), Janet Burchill and Jennifer McCamley (Melbourne), A.D.S. Donaldson (Sydney), Andreas Exner (Frankfurt), Jens Haaning (Copenhagen), Melinda Harper (Melbourne), Gerold Miller (Berlin), Mark Webb (Brisbane), and Heimo Zobernig (Vienna). Augmenting this selection will be a few carefully chosen surprises from the gallery stockroom. An important feature of the display will be a number of limited editions, including a new multiple by Danish conceptualist Jens Haaning (*1965) that will have an especially reflexive dimension in the fair context. Hand-painted IKEA copies of Alvar Aalto's famous stacking stool, the Haaning multiple is undoubtedly a parody of the deluxe item and what Marx called the “fetish character” that normally attaches to art. At the same time, it appears to reassert the pre-eminence of the original over its copy, and will perhaps remind Sydney art audiences of a moment, not so very long ago, when the city made an important contribution to international debates around strategies of appropriation in contemporary art. Finally, for the curated "Installation Contemporary" sector of the fair, Pestorius will present a new work by A.D.S. Donaldson (*1961). From the outside a more or less minimalist box, Donaldson's Abstrakt Kabinen (2002-13) functions at the overlap of the avant-garde's engagement with so-called little architecture — think El Lissitzky's Kabinett der Abstrakten (1926) or Oskar Schlemmer's Lackkabinett (1941) — and contemporary installation, although Donaldson's work is remarkably low-tech. On entering, a light comes on and the viewer is able to manipulate a number of sliding panels on which a small collection of abstract paintings is hung. They are thus able to arrange the space to their own liking and, once seated, enjoy the work at their leisure while a small exhaust fan extracts stale air. Interactive and straightforward, Donaldson’s work offers the viewer a radically intimate engagement with art and its structures. A scale model that German artist Erich Buchholz (1891–1972) made of his 1922 Berlin studio — the first modern installation in art history — and two other mid-Sixties Buchholz works that comprised the exhibition Erich Buchholz: Coloured Rooms (Pestorius Sweeney House, Brisbane 2001), have been reconfigured as a special room display for Minimalism in Germany: The Sixties ll at the Daimler Contemporary, Berlin. In 1922 Buchholz began to modify his Berlin studio, which was also his home, by removing or painting over its ornate wallpaper and adding brightly coloured geometric planes and relief elements to create a coherent abstract environment. In extending painting into architectural space, Buchholz pioneered the ‘art into life’ ambition of much 20th Century modernism. Buchholz's Berlin studio predates other more well-known artistic environments, such as El Lissitzky's Proun Room and Kurt Schwitters' Merzbau (both artists having visited Buchholz in his studio), and Piet Mondrian’s Paris studio. During the 1920s, it was also an important meeting place for the Berlin Dadaists and other members of the Central European avant-garde. The Buchholz model was brought to Australia when the artist’s daughter, Mo Wedd-Buchholz, migrated in 1974. At the time, Buchholz's extra-spatial achievement was not widely recognised in his own country. It has since been the subject of important exhibitions, including at the Queensland Art Gallery in 2000, while leading Australian art journals have published new scholarship in relation to it. Notwithstanding this, Australia's public galleries evinced no interest in securing the Buchholz model for Australia. Not since Basil Burdett's 1939 Exhibition of French and British Modern Art was warehoused in the cellars of the Art Gallery of New South Wales during the Second World War has such a significant artwork been so long in Australia, yet still manage to elude its state art museums. The Buchholz model was recently sold to the Daimler Art Collection by Brisbane gallerist David Pestorius, the Australian agent of the artist’s Estate. “I've got mixed feelings," Mr Pestorius said. "Of course, I'm pleased the model has returned home, but what this really highlights is the over-emphasis on figuration, and on landscape in particular, by our art museums, and just how little they value abstract art … they’ve never acquired paintings by Mondriaan or a Barnett Newman, despite their significance for successive generations of non-indigenous Australian artists, to say nothing of Aboriginal abstraction. Now they’ve missed the beginnings of installation art." For Minimalism in Germany: The Sixties ll, Daimler has commissioned Viennese artist Heimo Zobernig (* 1958) to create a special display for the Buchholz model on the occasion of its, and in some ways Buchholz's, 'return' to Berlin. The lecture-performances of Dave Hullfish Bailey are discursive presentations that transform the conventional artist slide-talk format into an artistic medium in its own right. Via unconventional analytical approaches and a series of lateral extrapolations, Bailey makes often-humorous connections to his subject matter that echo and elucidate his material production. Bailey's lecture-performance for the Auckland Art Fair (4–7 August), will reflect upon the procedures and implications of the CityCat Project, a collaboration with Brisbane Aboriginal activist and playwright Sam Watson that has been ongoing since 2003. In addition to his lecture-performance, Bailey will present selected aspects of the material production from the CityCat Project in the booth of David Pestorius. Dave Hullfish Bailey's visit to New Zealand was organised by David Pestorius Projects and realised in co-opertation with the Auckland Art Fair. 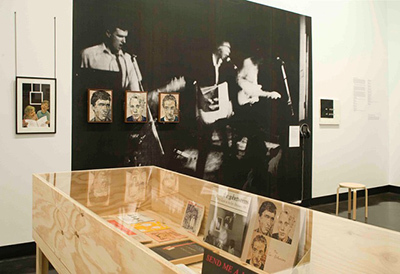 Mirroring street style and contemporaneous popular music, a distinct art practice emerged in Brisbane in the punk/post-punk 'moment' of the early 1980s. Aware of, and informed by, international currents in post-structuralist thought and No-Wave music, radical Brisbane artists nonetheless critically restructured these developments to their own creative ends. Through hybrid, performance-based events involving music, film, installation and performance, the artists in this film program challenged the revered art object as the fetishistic depository of beauty, and, like the Dadaists their work has been compared to, celebrated the power and pleasure of the instantaneous moment. Made in an era of repressive conservative rule and general cultural stagnancy, these Brisbane punk films provide a fascinating glimpse into the experiences of the artists who made them: Gary Warner, John Nixon, and Jeanelle Hurst. Projected from the original Super 8 and preceded by a short discussion by Danni Zuvela/OtherFilm. Dan Graham's visit to Australia was organised by David Pestorius Projects and made possible with the assistance of The Australia Council for the Arts, Queensland University of Tehnology, The Ian Potter Museum of Art, OtherFilm, and the Queensland Art Gallery/Gallery of Modern Art. Melbourne >< Brisbane: punk, art and after will trace the extraordinary interaction of the alternative music and art scenes between Melbourne and Brisbane during the punk and post-punk years, 1975–85. The exhibition reveals the entwined artistic and musical histories of the two cities through music, film, ephemeral publications, photographs and paintings by artists including Howard Arkley, Tony Clark, Brett Colquhoun, Peter Cripps, John Nixon, Peter Tyndall and Jenny Watson, and bands such as Anti-music, the Saints, the Go-Betweens, Nick Cave, the Birthday Party, Ed Kuepper, and the Laughing Clowns. Guest curator David Pestorius, a Brisbane-based arts activist, says Melbourne >< Brisbane explores the development of artists’ practice as a social and strategic experience. “The exhibition highlights a period when the repressive political regime at the time in Queensland drove the Brisbane avant-garde to a musically hungry Melbourne scene, with results that were often creatively explosive,” he says. “And Melbourne artists happily took up the challenge to confront the prevailing Brisbane sensitivities. “Crossing boundaries between art and music, gallery and gig, the exhibition reveals important strategies in the formation of a postmodern avant-garde, joining clusters of artists united by location, friendship, shared experience and interests. “In Australia, punk music offered artists new strategies for collaboration (with artists forming as bands), new models for presentation (promoting and staging exhibitions as gigs), new channels of communication (the cassette, the record, the ‘zine). Melbourne >< Brisbane traverses painting, photography, installation, video, film, music and writing. It features rarely seen archival and documentary material, including extensive private archives of audio tapes documenting performances by artists’ bands; Howard Arkley’s personal photographs of his Melbourne ‘Art tram’ and Brisbane ‘Muzak mural’ projects (Brisbane, 1981); Tony Clark’s early DIY operas under the Anti-Music banner; and Brett Colquhoun’s personal dialogue with the late Grant McLennan. Melbourne >< Brisbane also looks at a number of artist-driven projects that have called attention to this history, not only through its critical re-telling, but also via collaborations which demonstrate that the associations forged during the ‘historical period’ continue to resonate strongly into the present. Beginning with an important series of exhibitions organised by Peter Cripps at Brisbane’s IMA in 1985-86, Melbourne >< Brisbane will also highlight more recent art/music projects involving Tony Clark, Robert Forster, and Ed Kuepper. As part of the exhibition, New York artist Dan Graham will present a public screening of his film, Rock My Religion, an exploration of threads linking non-conformist religion, counterculture and punk rock.